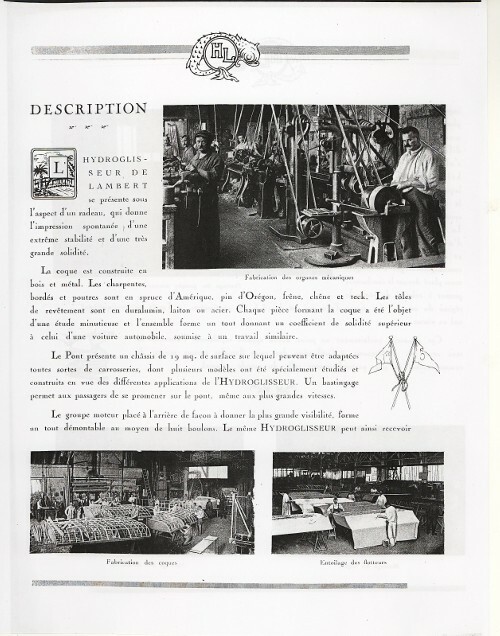 In next ‘HL’ “commercial catalogue”, probably from 1920, we are enthusiastically reading that “A new industry was born”. Before making big machines, Mr. Count Ch. de LAMBERT took long and extremely careful laboratory-tests, enabling him to determine the first principles and the theory itself of the hydroplanes. The first hydroplane in the world which was in action, manoeuvred on the Thames in 1897. It had a steam engine of 8 HP and weighed 600 English pound; the speed attained was 33 kilometers an hour. In 1904, Count de LAMBERT constructed another one equipped with a 12 HP de Dion-Bouton, which realized the speed of 36 kilometres an hour. In this era, this speed seemed enormous and the experiments found great acclaim. 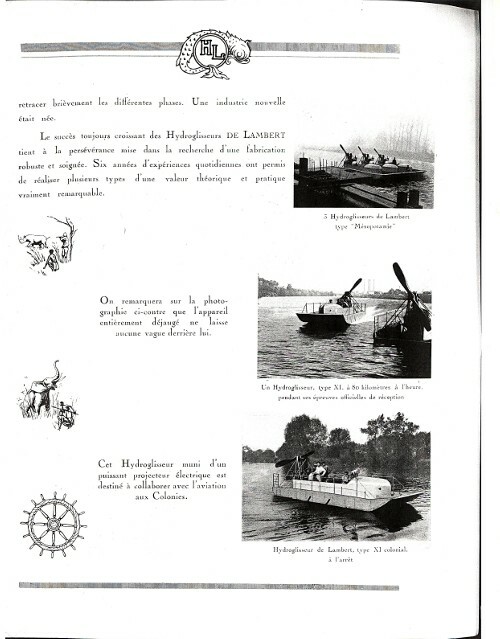 In 1906 Mr. de LAMBERT constructed the FIRST BOAT propelled by an airscrew, and reached with an Antoinette motor a speed of about 60 kilometres an hour. Finally in 1913, Mr. P. TISSANDIER on a hydroplane equipped with a 160 HP, reached the officially clocked speed of 98 kilometers 600. So the practical possibility gliding on water was realized due to the patient trials of Mr. Count Ch. de LAMBERT several different phases of which we have just described briefly. A new industry was born. The always growing success of the Hydroplanes de LAMBERT is connected with the perseverance invested in the research of a robust and careful construction. Six years of daily experience have permitted to realize several types with a real remarkable theoretical and practical value. leaves no wave at all. This Hydroplane equipped with a powerful electrical spotlight is destined to co-operate with the aviation in the Colonies. The Hydroplane de LAMBERT appears to be a raft and gives the impression of extreme stability and of a very great reliability. The hull has been constructed of wood and metal. The fuselage, crossbeams and spars made of American fir, pine from Oregon, ash, oak and teak. The material of the outer skin is of duraluminium, brass or steel. Each part of the hull has been subject to a very accurate study and the structure as a whole has a solidity superior to that of a car, which is constructed in a similar way. The deck has an area of 19m² on which all kinds of structures may be mounted, several models of which have been specially studied and constructed in view of the different applications of the HYDROPLANE. A railing allows passengers walking on deck, even at the highest speeds. The engine assembly is mounted at the rear to provide maximum visibility and can be easily removed entirely by means of eight rivets. may use several types of engine and of different power. The propulsion is effected by means of a lacquered and screened airscrew, driven by a chain transmission of the system “ DE LAMBERT “. The steering is done by means of a steering wheel and a foot pedal serves as throttle. A rev counter placed in front of the driver enables him to adjust the power of the motor. The draught which is 15 to 20 centimeters at rest, is practically nil at speed. This machine, perfectly designed, must quickly draw the attention of anybody interested in the use of waterways as for transportation and especially in the colonial world. 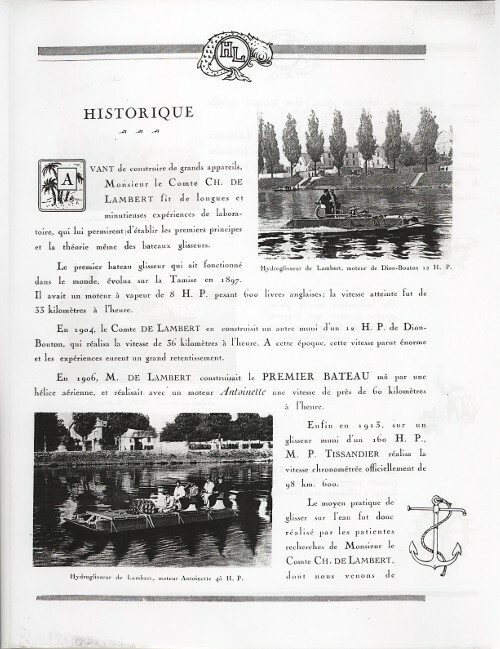 Already in 1913 and 1914 numerous colonial authorities, amongst whom we allow ourselves to mention the Generals GALLIÉNI, BAILLOUD, MARCHAND, CORDONIER, BARATIER, the Governor Generals, Messrs SARRAULT, MERLIN, MERLAUD-PONTY, JONNARD, have honoured our Establishment with their visit, have been unanimous in declaring that the HYDROPLANES should be used to change life in the colonies by providing transport over the large rivers where, as consequence of low water levels and during long months, any other type of navigation seemed impossible. 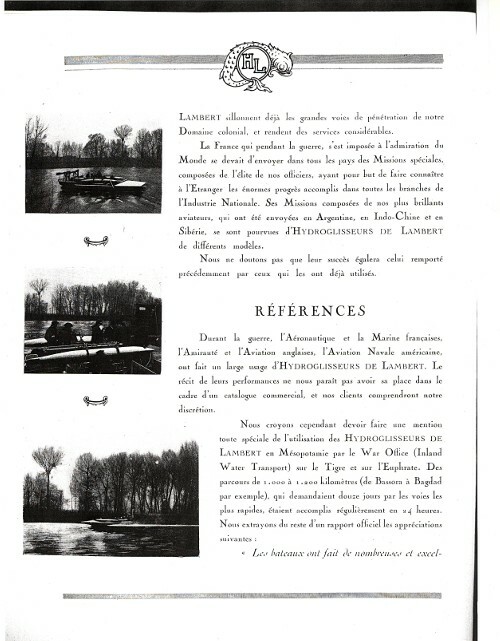 The men of action at the head of FRENCH AVIATION, who are honouring us with their confidence, have understood that the HYDROPLANE DE LAMBERT would be a valuable help for the Colonial Aviation, in those extensive areas totally deprived of roads, but on the contrary, wonderfully provided with streams and with rivers. Numerous HYDROPLANES DE LAMBERT are already providing excellent service on the waterways of our colonial territories. 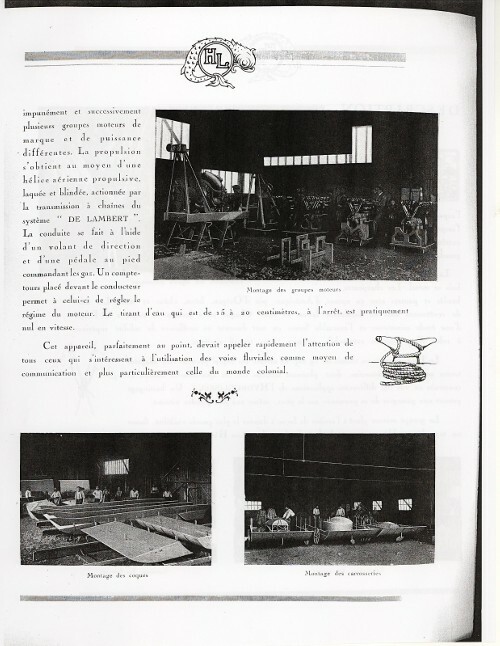 France, which during the war, earned the admiration of the World undertook to send special Missions to all countries, composed of the best of our officers, with the purpose to announce abroad the enormous progress made in all branches of the National Industry. Its Missions composed of our most brilliant aviators, which have visited Argentina, Indo-China and Siberia, have been provided with HYDROPLANES DE LAMBERT of different models. We do not doubt their success will be equal to that obtained earlier by those which have already used them. 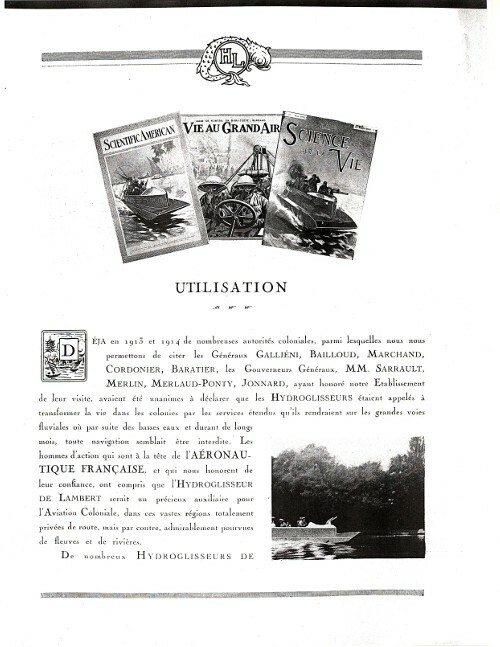 During the war the Aviation and the French Navy, the English Admiralty and Aviation, the American Aviation of the Navy, have made ample use of HYDROPLANES DE LAMBERT. The story of their operations does not belong in a commercial catalogue, and our clients will understand our discretion. 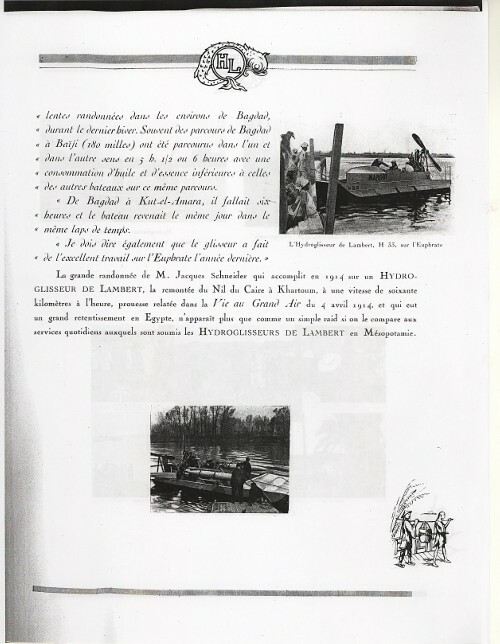 << The boats have made several and excellent journeys in the neighbourhood of Bagdad, during last winter. Often distances from Bagdad to Baïji (180 miles) have been covered in both direction in 5½ hours or 6 hours and with less consumption of oil and petrol than other boats over the same distances. From Bagdad to Kut-el-Amara six hours were needed and the boat returned the same day in the same time. 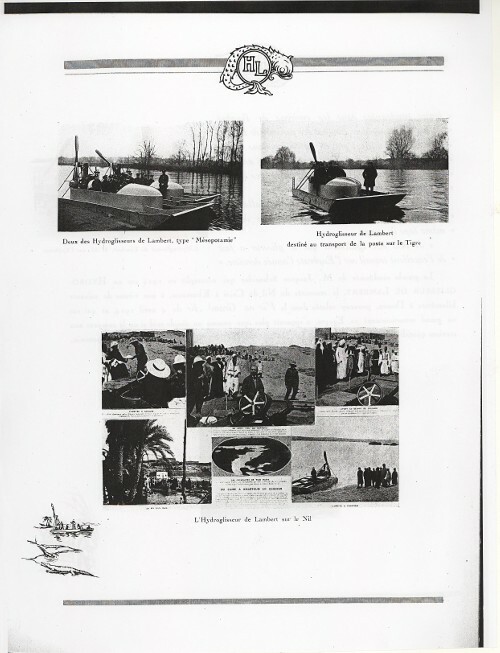 The big expedition of Mr Jacques Schneider who in 1914 on a HYDROPLANE DE LAMBERT, ascended the Nile from Cairo to Khartoum, at a speed of sixty kilometres an hour, tour de force narrated in the Vie au Grand Air of April 4 1914, and which found great response in Egypt, appeared not more than a simple exploration when it is compared with the daily services the HYDROPLANES DE LAMBERT are rendering in Mesopotamia.